Floaters Archives - Moran Eye Associates, P.C. Dr. Moran leads continuing education session on new technology and treatments. This past month, Moran Eye Associates held an educational event for local optometrists in the Lehigh Valley. Dr. Moran presented two lectures one on dry eye heat therapy, and the other on laser treatment for floaters. These sessions were approved by the Council on Optometric Practitioner Education (COPE) for continuing education credits for the doctors whoattended. During the lecture, our visiting doctors enjoyed a Summery spread of barbecue, salad, and snacks while listening to Dr. Moran’s lectures. Everyone in the office pitched in to make this homemade buffet. Beth made her famous barbecue (the secret is bacon! ), Dr. Tang provided a chocolate fountain, Cindy brought her mom’s special recipe potato salad, Bobbi made the tossed salad, Mandy made the drinks and decorated the office for the occasion. 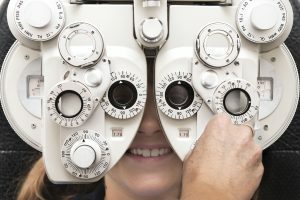 Until recently, doctors had limited options to offer their patients who experienced discomfort from dry eye, or whose vision was obstructed by bothersome floaters. Moran Eye Associates has been successfully implementing these new treatment options for the past six months with great feedback from our patients! “I feel that I had an extremely positive experience with the laser surgery on both eyes performed by Dr.Moran. I would recommend it highly.” Trudy S.
After the lecture, each optometrist had the opportunity to experience the heat therapy firsthand. They relaxed in our comfortable heat therapy room for 15-minutes, which is the same treatment that we provide our patients. The heat therapy treatment works by targeting the Meibomian glands in the lids. Our lids are lined with small Meibomian glands that secrete oil, which is an integral component of our tears. The oil prevents our tears from evaporating too quickly. Oftentimes, the glands become clogged, and the lack of oil flow leads to dryness, discomfort, and blurred vision. The focused heat treatment helps to improve the flow of oils. After the treatment, either Dr. Moran or Dr. Tang will help to further improve oil flow by manually manipulating the glands. Dr. Moran showed a video that showed the YAG laser in action as it targeted floaters. This painless treatment uses laser energy to transform the solid floater into a gas bubble, which then dissolves on its own. Moran Eye Associates is one of a few practices in the area that offers this unique in-office treatment. Educating patients and professionals is key to offering the best care to our patients. If you have any questions about Heat Therapy Treatment or Laser Floater Treatment , contact our office for more information or to schedule an appointment. New Patient Education Screens in the Exam Rooms. Dr. Moran knows that an informed patient makes the best health care choices, which is why we take the time to make sure that you have all the information you need to make the right choices for you and your family. As part of our commitment to patient education, we have recently installed education screens in our exam rooms. Dr. Moran’s goal has always been to give patients the information they need to maintain healthy vision. The addition of these screens takes us to the next level in increasing patient understanding. It’s best to Show & Tell! Now during your exam, not only can we explain what is happening with your vision, we can show you too! We can choose images and videos to help better explain treatment options. The best part is that these boards are interactive! Dr. Moran can draw and write notes on them to help you better understand your eye health and safety. Understanding Vision: Myopia, Hyperopia, Astigmatism & Presbyopia. And we are doing our part to save trees, too! With this new technology, we can take the information from the screen and email it directly to you! We also have the ability to print directly from the screen as well. As always, if you have any questions about caring for your eyes, please ask our staff. We are happy that we can now SHOW & Tell! To schedule your next appointment call or text 610-628-2022. If floaters are getting in the way of your vision, there is a solution. Laser Treatment for Floaters is now available at Moran Eye Associates. This painless, in-office procedure to remove and reduce floaters from your vision is covered by most medical insurances. The goal of this treatment, known as Vitreolysis, is to achieve a functional improvement so that you can return to day-to-day activities without the hindrance of floaters. In an exam room using the YAG Laser pictured above, Dr. Moran will apply laser light to evaporate the floaters. The laser pulses convert the floater molecules into a gas, removing or reducing the floater so that it no longer disturbs your vision. Before the procedure, your eye will be numbed with anesthetic drops. Then, a contact lens will be placed on your eye so that Dr. Moran can clearly see inside your eye while looking through a special microscope. During treatment, you may notice small, dark specks or shadows. The laser will make a clicking sound as the pulses of light are applied. Each treatment session will take about 20-30 minutes, and it may take two, or possibly three sessions, in order to achieve the best result. Are you a candidate for Laser Floater Treatment? Before you schedule the laser procedure, Dr. Moran will need to see you for a dilated evaluation to determine your eligibility for vitreolysis treatment. Considerations include your age, how long you have had the floaters, and the characteristics of the floaters themselves. Are there different types of Floaters? Yes. Floaters are the small pieces of debris that float in the vitreous (clear fluid) of the eye. Floaters can appear long and stringy, cloud-like or round. Fibrous Strand Floater: Most common in young people, this thin, dense floater can appear as dots, or stringy cobwebs, which are a result of clumping of the collagen in the eye. Depending on the size and location of this floater, it may be treatable with vitreolysis. Diffuse Floaters: This cloud-like type of floater is caused by the natural aging of the eye. Due to the scattered, wide-spread nature of this floater, it may require multiple treatments for best results. Weiss Ring Floater: This large, ring-shaped floater is located safely away from the lens and the retina, which makes it a good candidate for this procedure. If you have more questions about this procedure, set up an appointment for an evaluation to see if we can make your vision floater-free 610-628-2022.